So, the couple of references to Jimmy Buffett I have done lately made me think of one thing…the beach! O.K. maybe two things, the beach and margaritas! My favorite time to go to the beach is any time but the only time of year I can get my husband to actually go and sit on the beach with me is October. So I guess that makes October my favorite time. I don’t know about you, but I have beach rituals. You know the things you have to have in your bag for the beach. For me, sunscreen, of course, a food magazine or any Mitch Albom book, a camera, a refreshing beverage (that’s probably a whole other blog post), fresh pineapple and CHIPS. No, not the Erik Estrada, Ponch kind, although I did use to have a crush on Larry Wilcox! I don’t know if it is the fresh salty sea air that makes me crave chips, or what, but I can go all year without munching on any, until my toes hit the sand. This year I was in luck to find a guilt free (GMO & gluten free, too) just as tasty as Pringles chip…and yes, I do eat the whole container. Don’t judge, it is a whole day on the beach! Yep, the only thing I ever have left are those broken pieces that fill up the bottom of the barrel…but that’s a good thing! It’s like a little part of the beach going back home with me. This recipe works well with any leftover beans you may have. I didn’t have any leftovers because I just got back from the beach! 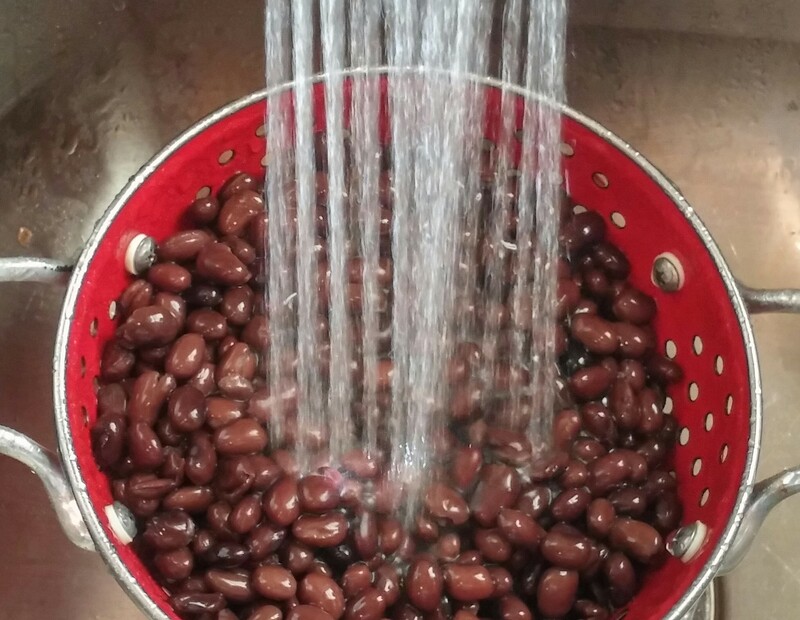 So I used 2 cans of black beans but use your favorite kind. Rinse and drain well. (Actually most of the can vegetables that you buy, you should rinse, cuts down on the sodium level.) 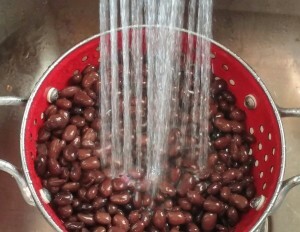 Then I go to work mashing most of the beans, let’s do the mash. (If it will help to play MONSTER MASH go ahead and do it, now is the time of year!) I add in some sautéed onions and garlic (about 1/2 cup), chopped jalapenos, along with some toasted cumin, chili powder, and cayenne pepper-give it a little whirl in a dry skillet over medium heat, a little heat brings out the aromas! I also like to add in one shredded carrot-just use your vegetable peeler. I love the touches of color it gives and adding in a vegetable never hurts! You could use an egg to hold it all together, but did I tell you my husband HATES eggs, won’t eat them, so either I sneak it in when he is not looking or I get creative! Most of the time, I get creative! So that avocado on the counter that got left behind and missed the beach trip is going to be my glue! I’m safe, he LOVES avocado! I add it to my bean mixture and give it another mash before folding in my beach chip crumbs which will work as my bread crumbs. So if you need to crush them some more, go ahead, they should resemble bread crumbs. Wet your hands, they will help you form patties from the bean mixture. Form the burgers, sitting them on wax paper as you go. This batch made 6 burgers. Let them chill in refrigerator for about 1/2 hour-they’ll hold together better cooking. Cook as you would your favorite burger. Just give a spray of olive oil or non-stick spray and grill, bake, or broil. 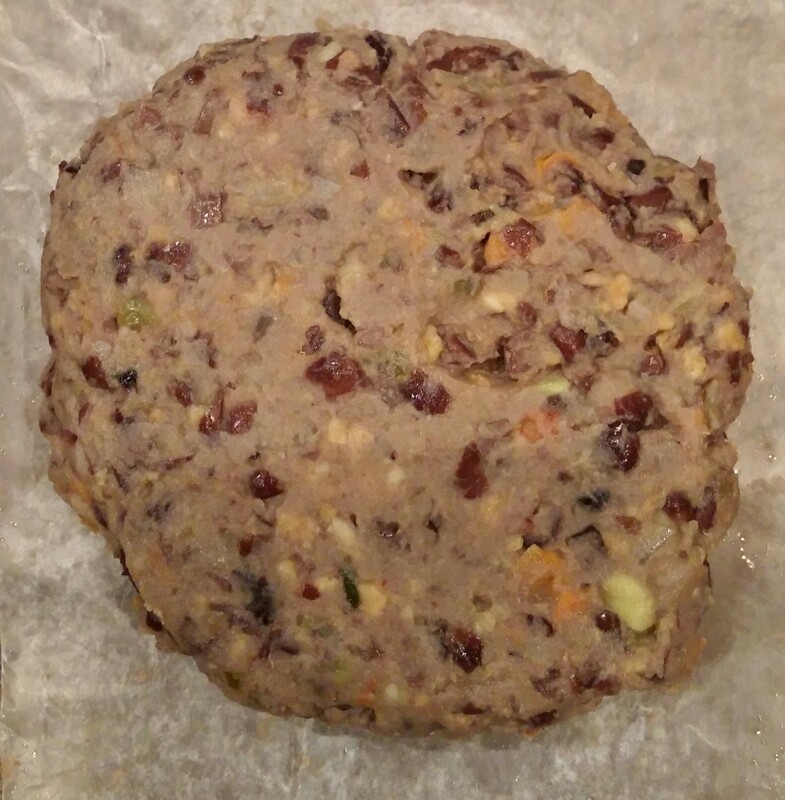 You can freeze the patties as is-cut the wax paper to wrap then put in freezer bag, but I prefer to cook them, then freeze any that are leftover, for an even quicker meal. You can certainly treat these burgers as you would a regular burger, with “mustard be nice, heaven on earth with an onion slice, cheeseburger in paradise, I like mine with lettuce and tomato, Heinz 57, and French fried potatoes, a big kosher pickle…” See, still have Buffet in my head and I haven’t unpacked yet, so technically, I’m still on vacation! 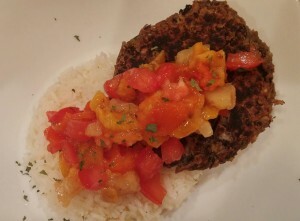 That means I am craving my beautiful bean burger island style! 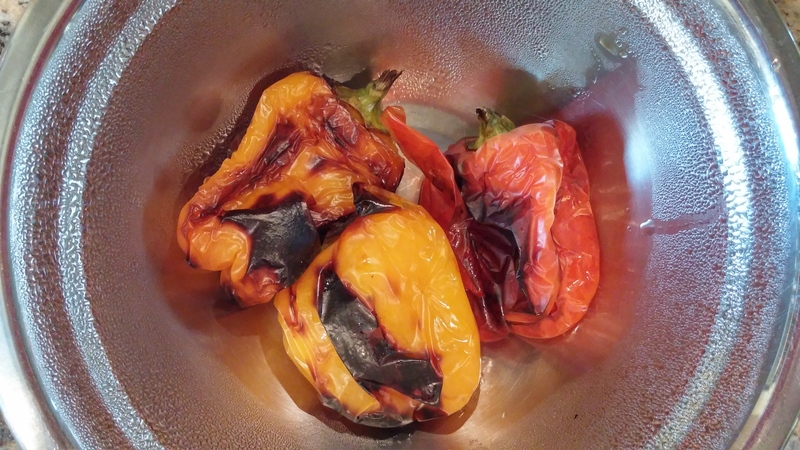 Let’s go get some peppers to roast: They are many ways to roast peppers, I prefer to take the easy way out, set them in the oven and broil usually until I smell them, about ten minutes, then flip, roast another 10 minutes to char. If you burn parts of them, congratulate yourself for a job well done-that’s a good thing, that means they will have more flavor. Remove them from the oven and place in a bowl. 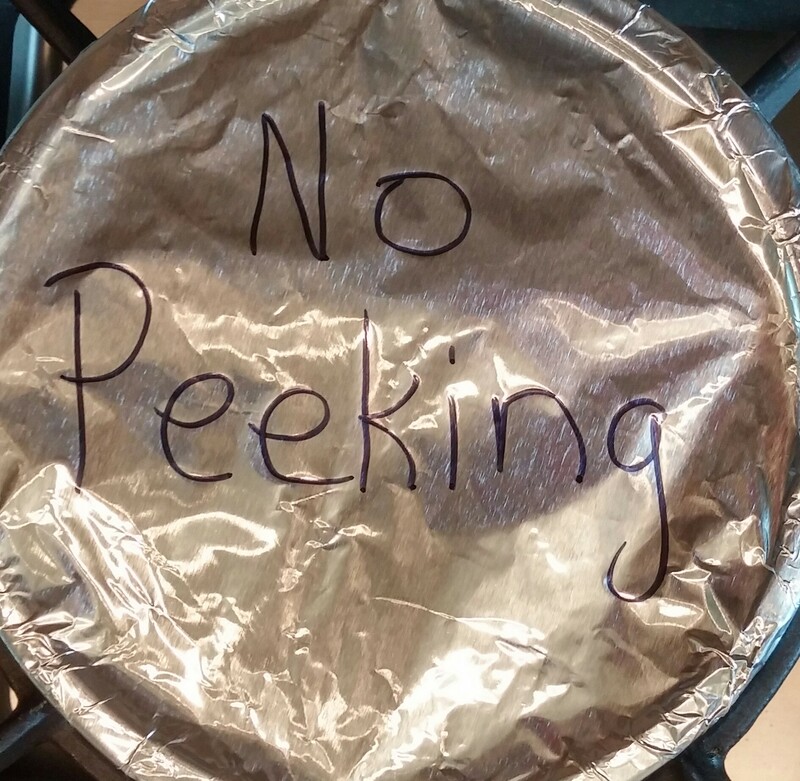 Cover the bowl with foil and let steam for at least 10 minutes. 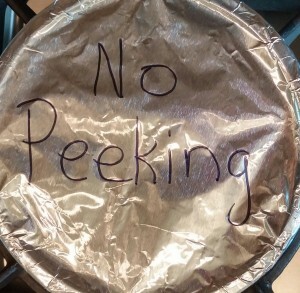 Now for the tricky part-NO PEEKING! Carefully remove the skin, it should peel off easily. I save the skin, put it in a jar, cover with some olive oil, keep in fridge for a day, then I strain it and use the flavored oil for bread dipping (my hubby’s favorite) or to brush on pizza crust before topping it. (Don’t recommend keeping it for longer than two days) Use a knife and cut down one side, stem should pop right off along with most seeds; lay pepper flat and use knife to scrape off any remaining seeds. Use them as you would like. 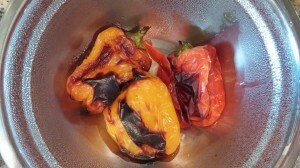 The peppers can be saved in olive oil for one to two weeks in fridge or a few months in the freezer as is (without oil). Remember that fresh pineapple? Don’t know how it happened but I managed to come home with some in my cooler-YEAH! 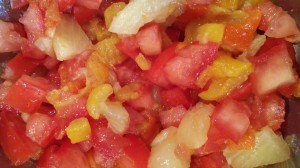 So I chop some pineapple, tomato and peppers-instant tropical island salsa! (There is a lot you can add, but I like it simple, maybe a little cilantro) For me, any kind of tropical salsa just screams coconut rice! What? You haven’t had any yet? You are missing the island ferry! It is so easy! There are some delicious coconut rices made with fresh or canned coconut milk, not something I have on hand, but what I do have is my after workout old reliable coconut water. It does the job nicely. Use it in place of water when making the rice, not brave enough at first? For a milder flavor, use 1/2 water 1/2 coconut water or coconut milk! Jasmine rice works best! That’s it, make it according to package directions. Promise me you’ll try it! The smell alone will make you think you are on a beach vacation. My island style burger is ready to be assembled! Back to the beach, for a few bites anyway! Put your TO COOK IS TO CREATE thinking cap on: Think about all the different flavors of chips, what’s you and your family’s favorite? Whatever the flavor, think of complimenting flavors-for instance, bar-b-que chip crumbs are great in a ground chicken burger with corn, pickles and slaw! 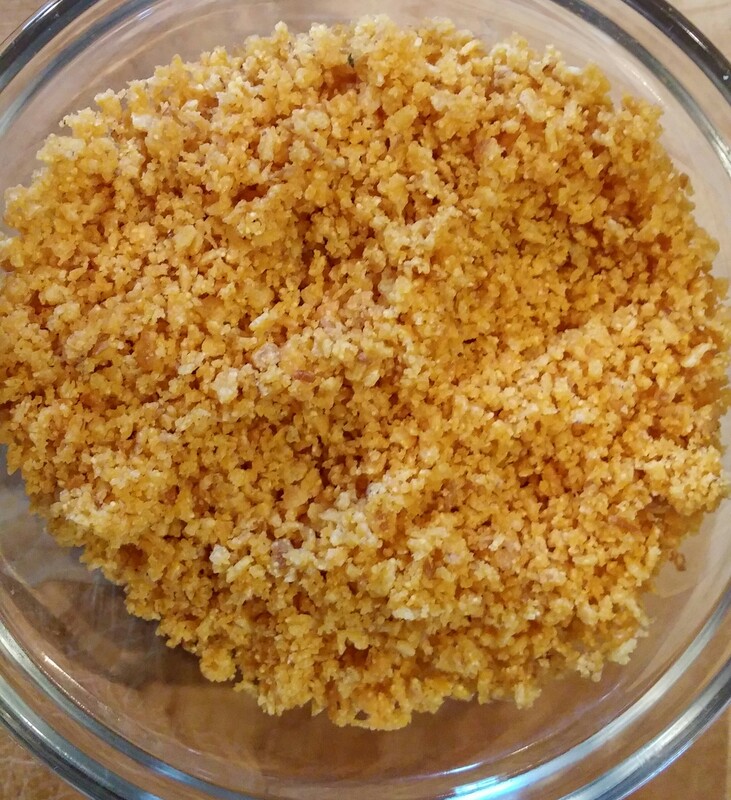 Think of chip crumbs as a substitute for bread crumbs-what else would the chips be good in? How else could you use them? FOOD FUN: Get your family and friends together and have one last beach blast, one last trip to Margaritaville- even if you have to wear your Hawaiian shirt under your jacket! Put on that island music and do the limbo in the living room! Laugh and have fun-“If we couldn’t laugh we’d all go insane” O.K. I promise not to reference anymore Jimmy Buffett songs…for a little while anyway, you know fruitcake season is coming and I may not be able to resist!